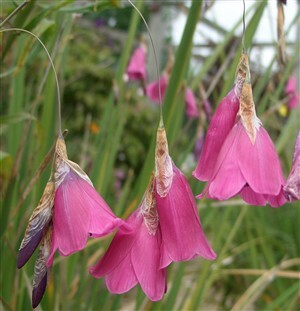 Dierama pulcherrimum (Angel's fishing rods). A most beautiful plant with tall, arching, graceful, thin, wiry stems and pinky purple bells cascading from it. Captivates all that see it. Requires well drained soil (even though it is often seen near water where its reflection is lovely, boggy conditions will kill it quickly) but not too dry.